For those of us who’ve enjoyed the privilege of sharing our days in the field with that special hunting dog, will relate to frustrating days of training, endless hours of hope and then that “spark”. It’s as if a light switch gets clicked on, and suddenly that fun-loving puppy on the back of the truck turns into a dog. 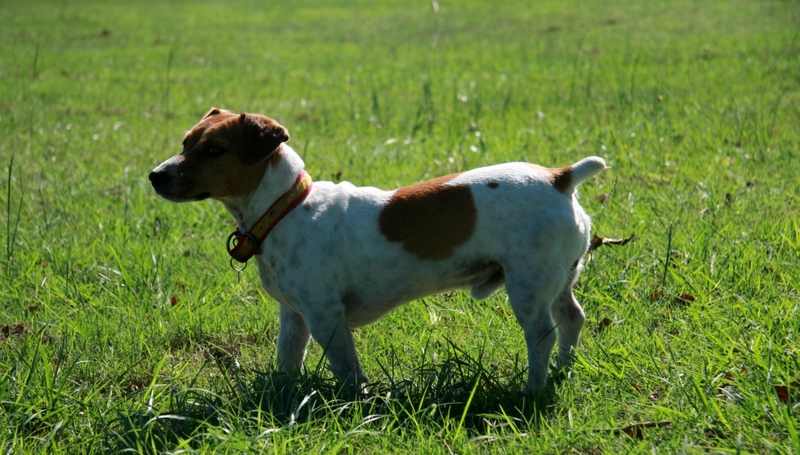 Over the course of the past four years most of you have got to know my Jack Russell, Bongo. It may have been while on safari with us or via our many safari stories. He’s a plucky little fellow, a typical Jack Russell, more heart than brains. I’m sure he sees a full manned lion every morning he stares into the mirror, how else could one explain his lack of respect for any dog double his size and most animals a hundred times his weight or more. While he has been a great friend and companion over the years, he never quite kicked on from those initial promising hunts. He never took to hunting like his old man, Jack, my old friend who served bravely for more than ten years. It was as if he was missing something, he’d chase hard, most of the time too hard, losing the track of his wounded quarry. At one stage I thought about using a leash to slow him down, but it frustrated us both to no end. I finally gave up. I resolved to the fact that he was a great little dog, who’d save our bacon from time to time, but wouldn’t be setting the world alight with amazing chases and unbelievable finds. Bongo’s old man, Jack, a legend of his time. That was until late 2011. I thought I noticed a change, but it was too late in the season to see him kick on and become the dog I hoped he’d be. 2012 rolled along and Bongo’s season started like many other hunting dogs first hunt of the year. Too much excitement, a lack of consistency, and generally bad behavior. Yes, even dogs can be rusty. As the season grew on, and the days became shorter and the nights longer, Bongo started growing in stature. 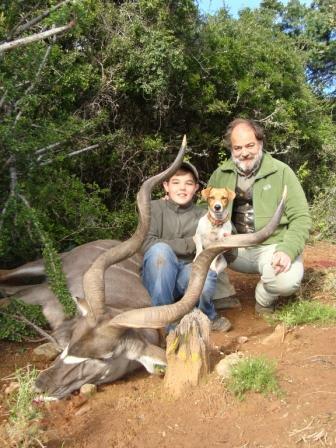 By early June he’d saved our bacon on numerous occasions, but it was not until a certain Waterbuck hunt that Bongo clearly announced his arrival as part of our team. It was early morning, a friend Jason, had hit his Waterbuck a tad low in the chest. At the shot the bull veered sharply to the left and disappeared into the undergrowth. By all accounts things looked good and blood was found within minutes. Zwayi gave the familiar nod; our bull wouldn’t be going too far. As per usual Bongo took off at a rate of knots and disappeared into the undergrowth. Foxy followed in close pursuit. We gave it a few seconds to wait and listen… There it is or were we imagining it, we could barely hear dogs barking in the distance, a clear indication of a bayed animal. We set off at a frantic pace of our own. 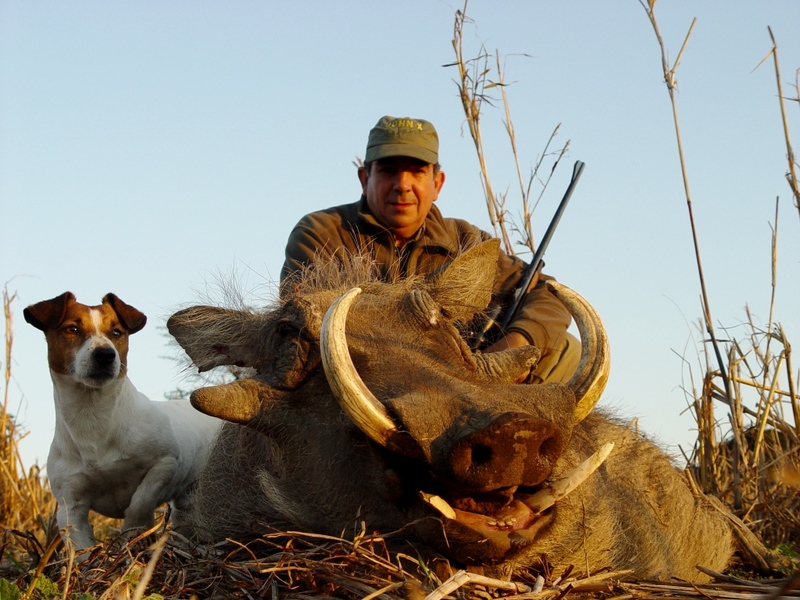 When it comes to a bayed animal it’s important to know that a dog will only hold an animal that long, if you for one reason or another cannot reach them fast enough, and that animal breaks away continuously, the dogs will lose interest. Our dogs are trained to hold a wounded or weakened animal, not any animal. As we approached the commotion in the thick undergrowth the bull must have heard us trying to force our way forward. He took off again. This happened for the next two hours. Just as we’d be getting Jason into a shooting lane, the bull would turn and make a dash of another 300-400 yards. The dogs were clearly starting to show signs of frustration. After a couple of hours we lost the track and the dogs altogether. What would seem as a simple way forward by splitting the three of us into three different directions to listen for the dogs proved to be much more complicated than usual. 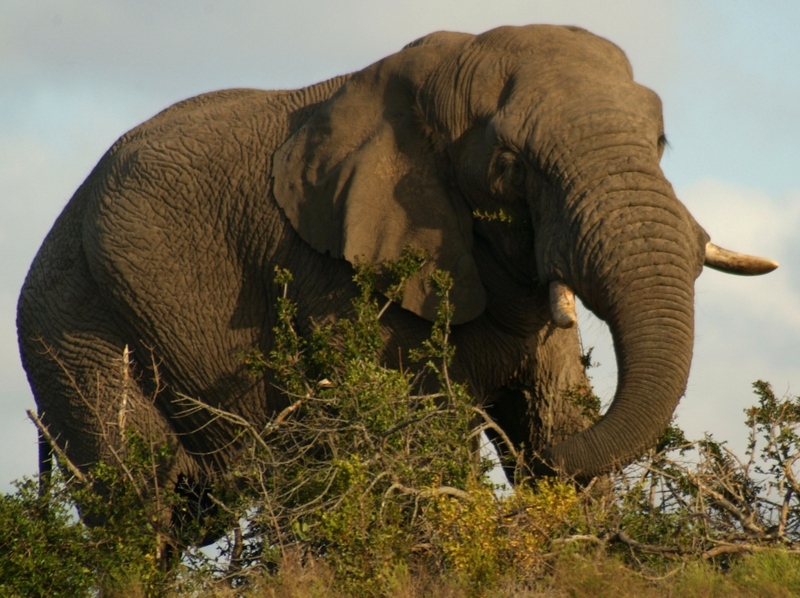 When hunting a Big 5 area and sharing your immediate vicinity with a stroppy Elephant bull and a large pod of hippos, things can become increasingly complicated. It was decided to stick together – the smarter option placing all responsibility of safety towards my trusty 416 Rigby. With a minor Elephant incident behind us, we continued wandering in the direction of where last the dogs were heard baying. As we approached a deep secluded valley we starting hearing the dogs much clearer. 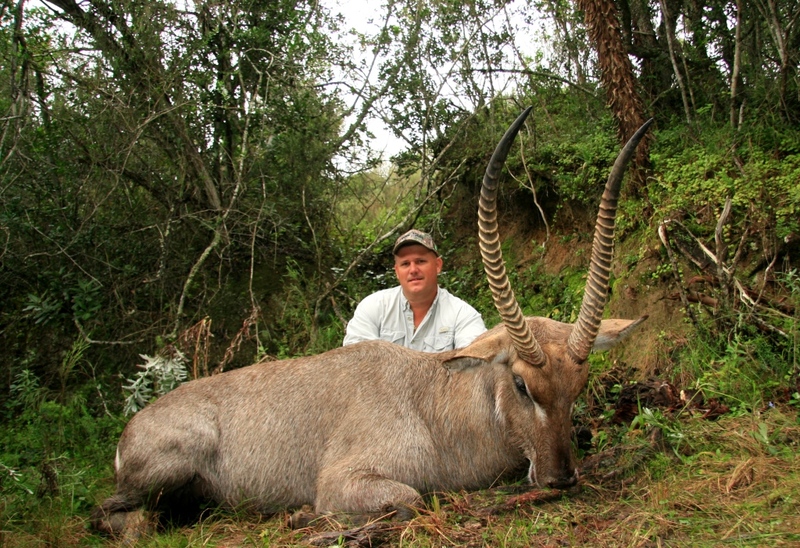 They had our Waterbuck bayed up against a 3 meter drop off and thickets on both flanks. Either the bull would have to run right over them or turn and jump. This time we approached with utmost caution. Weary legs and tired eyes combined with electrifying nerve ends would not allow us to botch this one. Another shot had to be taken soon or we’d surely lose our bull. As we entered the final 10 meters before seeing our bull we realized the bull had bayed up in a Hippo tunnel. These tunnels or lairs are used by Hippos during the heat of the day to protect their sensitive skins from the blistering African sun. Making the final bend, approaching slowly, the bull spotted us. He turned and disappeared over the edge. With a crash and a splash he landed in a lake, making a swim for the opposite bank. We ran to the edge arriving just in time to see him emerging from his dive. Without hesitation Bongo flew off the edge, not willing to give up his quarry just yet. With Bongo now gaining on the Waterbuck we soon spotted a hidden danger. Watching from the opposite bank a lone Hippo bull made his way towards Bongo and the wounded Waterbuck. Things were going to get ugly. We all held our fire. If we were to finish the Waterbuck in the water, he may sink and our trophy would forever be lost, but it may turn Bongo back towards us realizing the Waterbuck had disappeared under the water. 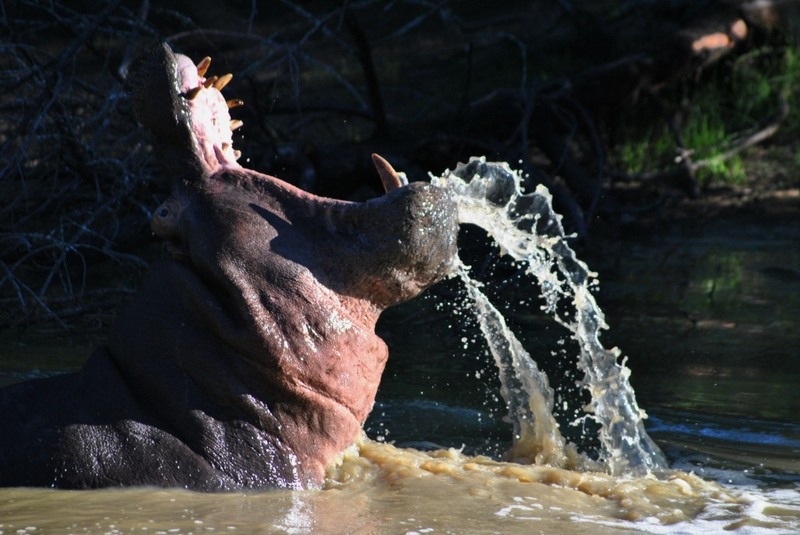 Or do we fire a warning shot at the Hippo, considering it may spur the fearless Bongo onto a bigger target. We stood there hoping both would reach the opposite bank before the Hippo reached them. With one final push both Bongo and the Waterbuck reached the opposite bank. Jason and I fired simultaneously. The bull took off once again. And Bongo disappeared after him for yet another time. Things quieted down. We circled the lake and found them. Bongo worn out, but prouder than ever. Needless to say you couldn’t wipe the smile off my or Jason’s faces for weeks. A champion had arrived! Since then Bongo has been leading the way with world-class finds and many brave stand offs. He has taken his rightful place at the head of the team when it comes to follow ups on any wounded quarry. He has most certainly kicked on from those initial promising moments. Foxy on the other hand – Well she’s now our puppy on the back of the truck. It will all be fun and games until her switch gets clicked. Bongo, mate I owe you an apology… I should never have doubted you.